Image: Forecast CO₂ concentrations at Mauna Loa over 2019 (orange), along with previous forecast concentrations for 2016 (blue), 2017 (green), 2018 (pink) and Scripps Institute measurements (black). During 2019 Met Office climate scientists expect to see one of the largest rises in atmospheric carbon-dioxide concentration in 62 years of measurements and warn that each year’s CO2 is higher than the last. With emissions already at a record high, the build-up of carbon-dioxide in the atmosphere will be larger than last year due to a slower removal by natural carbon sinks. In December 2018 the Met Office global temperature forecast also suggested that 2019 will be close to record warmth due to climate change and the added effects of El Niño-related warming in the Pacific. 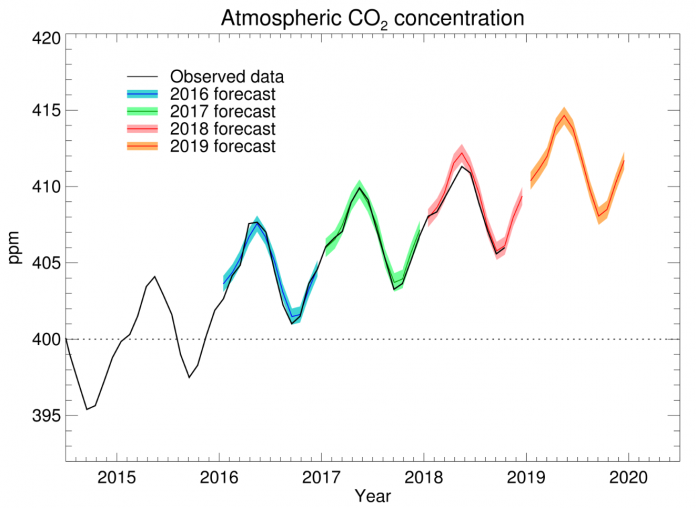 The Met Office CO₂ forecast is based on a combination of factors including rising anthropogenic emissions and a relative reduction in the uptake of carbon-dioxide by ecosystems due to tropical climate variability. The CO2 concentrations at Mauna Loa are measured by research institutions in the USA – the Scripps Institution for Oceanography at UC San Diego and the National Oceanographic and Atmospheric Administration (NOAA). Weather patterns linked to year-by-year swings in Pacific Ocean temperatures are known to affect the uptake of carbon-dioxide by land ecosystems. In years with a warmer tropical Pacific, many regions become warmer and drier, which limits the ability of plants to grow and absorb CO₂. The opposite occurs when the Pacific is cool, as happened a year ago. “Since 1958, monitoring at the Mauna Loa observatory in Hawaii has registered around a 30 per cent increase in the concentration of carbon-dioxide in the atmosphere. This is caused by emissions from fossil fuels, deforestation and cement production, and the increase would have been even larger if it were not for natural carbon sinks which soak up some of the excess CO2. This year we expect these carbon sinks to be relatively weak, so the impact of record high human-caused emissions will be larger than last year”. The Met Office forecast suggests that the annual average atmospheric CO₂ concentration at Mauna Loa will be 2.75 ± 0.58 parts per million (ppm) higher in 2019 than in 2018. This figure would be among the largest annual rises on record, but less than those in 2015-2016 and 1997-1998 – years with El Niño events and hence large Pacific warming. In the first decade of measurements, the rise of atmospheric CO₂ was less than 0.9 ppm per year. The rise has since become generally faster over time as human emissions have increased, but with fluctuations related to climate swings such as El Niño. The average CO2 concentration in 2019 is forecast to be 411.3 ± 0.6 ppm, with monthly averages reaching a peak of 414.7 ± 0.6 ppm in May, temporarily dropping back to 408.1 ppm ± 0.6 in September before rising again at the end of the year.